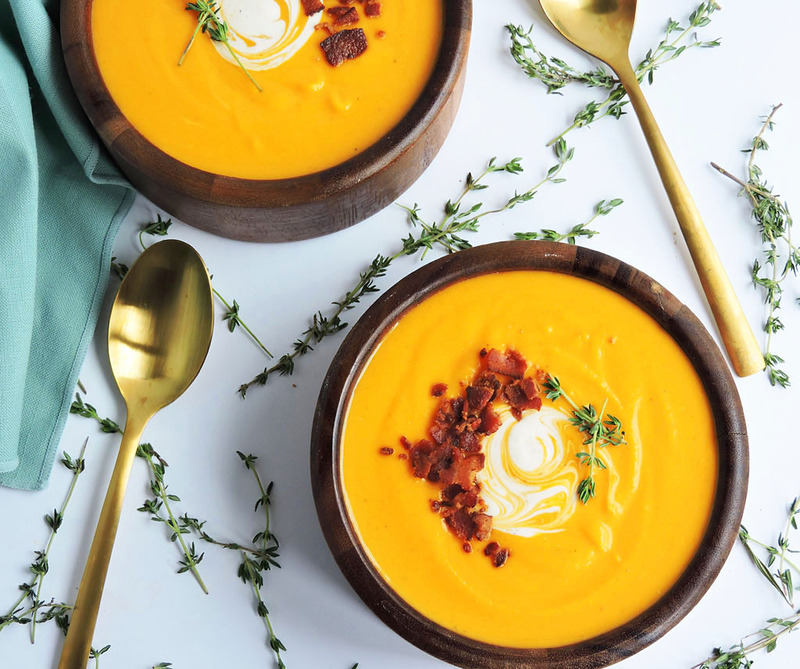 As the weather gets a little cooler, grab a bowl of this warm and cozy Brown Butter Bacon Butternut Squash Soup! 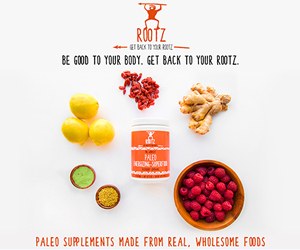 It’s the perfect recipe to welcome the Fall season! 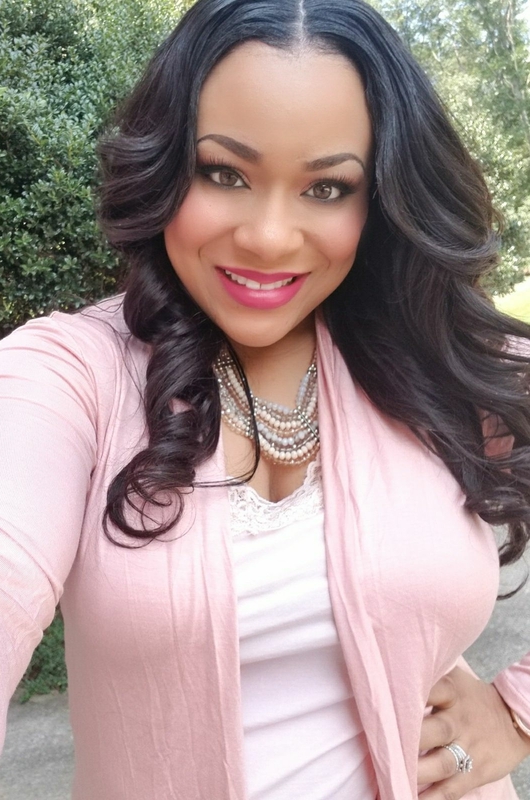 Alright y’all, it’s officially Fall! But because I live in Alabama, this means absolutely nothing!! Lol! It’s still 80-90 degrees outside and I still have my air conditioning blowing on high! Lol! Even though it doesn’t feel like Fall outside, I’m completely in the holiday spirit! In my opinion, Fall means carnivals, family gatherings, and tons of soup! I had 2 beautiful butternut squash just sitting on my kitchen table and knew that I wanted to make a soup. 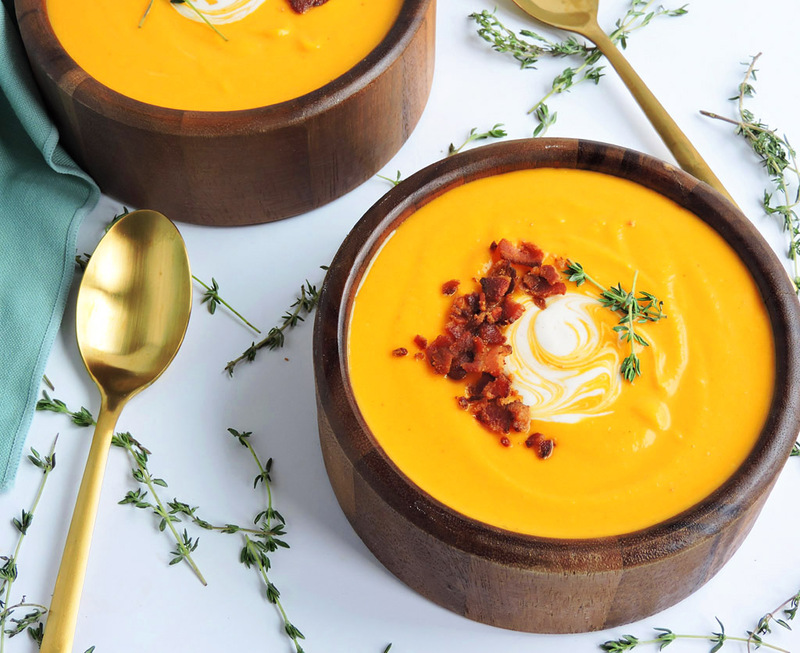 I’ve made a delicious butternut squash bean-less chili in the past, but never butternut squash soup…so I decided to open a few recipe books to get a little inspiration! I found absolutely NO inspiration in my recipe books! Every recipe contained all of these extra ingredients, and I just wanted a simple butternut squash soup! So guess what y’all, I decided to wing it and hoped for the best lol! 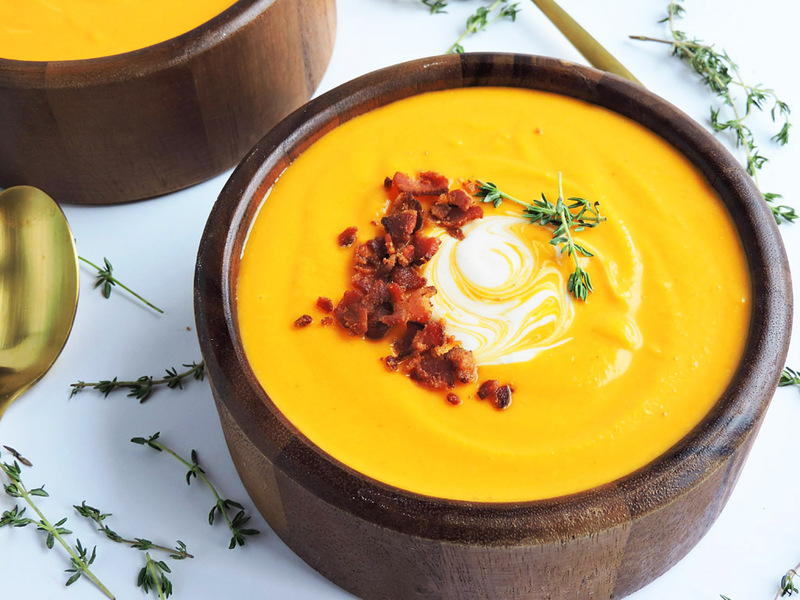 When I started preparing this soup, I knew that I wanted it to taste savory and with plenty of bacon flavor. I started off by cooking my bacon in a large pot and saving the bacon pieces to crumble on top of the soup later on! I added butter and let it brown a little bit. Then I added the onions, garlic, butternut squash, and chicken stock and let the butternut squash cook until soft. Once the butternut squash was soft and completely cooked, I took an immersion blender to completely puree the ingredients. I LOVE, LOVE, LOVE my immersion blender! It’s an essential when making soup! 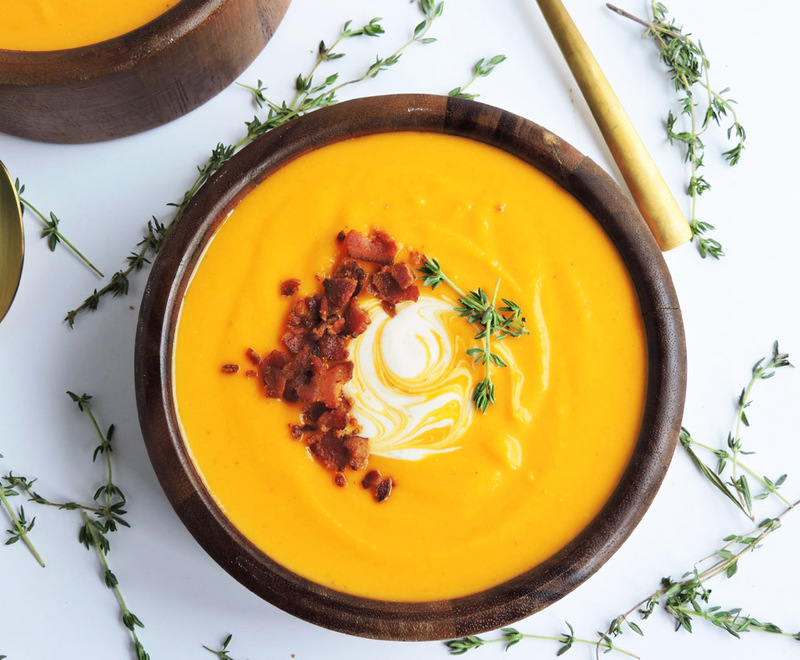 You can make this Brown Butter Bacon Butternut Squash Soup without it, but you will have to wait until it cools and then add it to a blender. I don’t have that kind of time, so that’s why I invested in this immersion blender! Lol! Once everything was blended, I stirred in my milk and seasoned the soup with salt/pepper to taste. 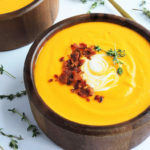 This Brown Butter Bacon Butternut Squash Soup was AMAZING! The flavors were so savory, but with a slight hint of sweetness! The bacon flavor really made this soup so good! My entire family enjoyed this recipe and I know that you will too! In a large pot, cook the bacon on medium heat. When done, remove the bacon from the pot and save for later. In the same pot, add butter and cook until slightly brown. Add onions and garlic and cook until fragrant. Add butternut squash and 2 and ½ cups water. Stir, cover, and reduce heat to low. Let cook for about 30 minutes or until butternut squash is completely cooked and soft. If you have an immersion blender, blend ingredients until smooth. 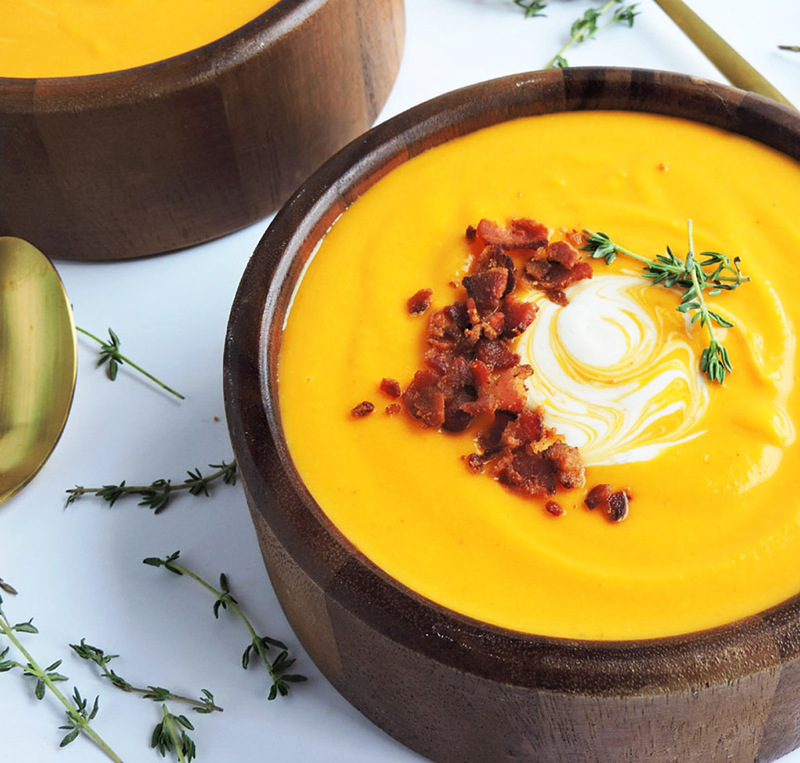 If you do not have an immersion blender, let soup cool for about 30 minutes and then add it to a blender and blend until smooth. Bring pot back to low heat, and stir in 2 cups of milk. Soup should be creamy and smooth. Season with salt and pepper to taste. Serve with crumbled bacon on top, and with a dollop of sour cream and thyme if desired.